Let's see...Ravioli. Pot stickers. Won tons. Gyoza. Dumplings. Pierogi. Samosas. Bao. Tamales. And the undoubtedly all-American addition, the Totino's Pizza Roll. Yes, there are all sorts of stuffed dough pocket-type constructions from all over the world. Obviously that's a short top-of-the head list. There's some differences, of course, from dough to stuffing material to size and prep methods, but it's a very common concept. Mostly because it's tasty. But until now, I've never heard of the Russian contribution to this realm, pelmeni. 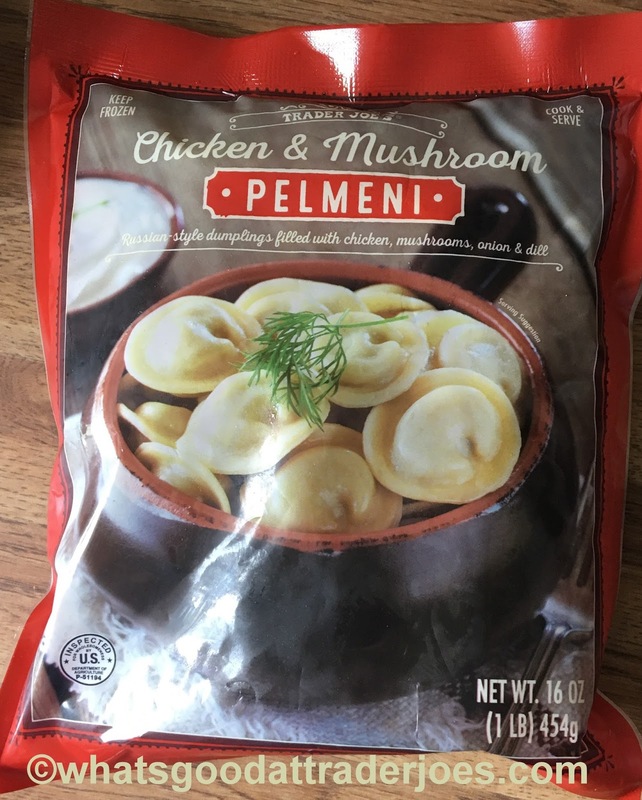 Well, here's Trader Joe's Chicken & Mushroom Pelmeni on my dinner plate. All these little bite sized little dumpling deals all up in my bowl. Please God, no borscht in here....not that I have any idea what borscht really is. Whew. No borscht! We're already ahead here! As for everything else, it's a tasty enough bite. The dough is thin and kinda eggy but good in a comforty, nondescript way. As for the middle filling, the chicken and mushroom and whatever else gets rolled up up in some sort of soft meatball-type morsel that, strangely, doesn't taste all that much like either chicken or mushrooms. It's just kinda there. And it tastes good, again with a comfort type-vibe, but I wouldn't be able to tell you what it was. It's kinda salt and mild seasonings. That's kinda the issue, I think. Again, nothing all that wrong with the pelmeni, but in a crowded field with so many similar products (most of them more familiar to the presumed typical consumer palate), there's nothing settting these apart. I wouldn't mind eating them again, and I'm not upset we still have a bag and a half of them in our freezer. But I'd never make a big fuss about getting them again, either.I couldn't tell you what the difference between these a regular bag of potstickers except maybe the pelmeni are more square. Sandy and I both liked them for a midday lunch date at my work place. Our kids stuck to their cheese pierogi, because God forbid they ate something out of the usual. Then again, I can't say we really did, either. Eh well. The traditional (and critical) pelmeni accompaniment is sour cream. Pelmeni are absolutely wonderful! If you have them nice and hot, with sour cream and a little sprinkled dill on top! MM! You should then wash it all down at the end with some hot, sweet black tea. :) Very cozy, nice and fun little snack for a cloudy, rainy day! The Trader Joe's pelmeni actually have dill in the filling, which I liked. You have to toss them in butter before serving with sour cream, but why trader joes decided to use chicken / mushroom filling is beyond me. No russian ever used that filling. Pelmeni are made with veal, beef, pork mixture. Other than that the execution is faithful, just why the filling?!!! These are OK but they don't measure up to the ones I have had in Russian Restaurants. You’d toss these away and ask one of your Russian friends to make you real ones. Everything in these ones is wrong, from dough type to the filling. You’re welcome. I have tried these, the recipe is not traditional, but very tasty and well executed. The price is far cheaper anything Russian store has to offer. I love these little devils. I have been making and eating PELMENI all my life. TJ's PELMENI are definitely a winner in my book. Got these because they tasted great and the price was good. Just no idea how to serve them if making dinner. Any ideas? Did you read instructions and see serving suggestion picture on the package? That is a good way to start. oh my god, this stuff is disgusting. got all slimy. looked like oysters and snails mixed together. tasted worse. I Googled these, found a bolg where someone reviewed them just to leave a review saying that these are horrible. It's funky it's rather air freshener-ish. I applied a liberal coat of butter and I still could not eat these.